The 4R Nutrient Stewardship Certification Program has announced that Heritage Cooperative’s facilities located in Sycamore and Upper Sandusky, Ohio have been added to its growing list of nutrient service providers to achieve certified status. The voluntary certification program is a concentrated effort by the agriculture industry to significantly reduce and prevent applied nutrients from running off fields, which has contributed to algal blooms in Lake Erie, such as the one responsible for the shutdown of Toledo’s water supply in August 2014. Both facilities have been in operation since 1965, providing the “Crop Advantage” program, which includes GPS soil sampling, 4R fertility recommendations, variable rate fertility applications, variable rate seeding prescriptions, field scouting and more. They also provide custom application services and SurGrow, Croplan and Monsanto seed brands, and handle anhydrous ammonia. The program certifies nutrient service providers in the Western Lake Erie Basin that apply or make recommendations on how nutrients should be applied to crops are doing so in accordance with 4R Nutrient Stewardship principles – which refers to using the Right Source of Nutrients at the Right Rate and Right Time in the Right Place. Program participants must go through an independent, third-party audit and demonstrate they not only understand 4R principles, but also follow them. Approximately 2 million acres and over 4,500 grower customers are serviced by the 28 facilities in Ohio and Michigan that have earned 4R Nutrient Stewardship Certification, with approximately 75 percent of those acres located in the Western Lake Erie Basin. “Heritage Cooperative’s Sycamore and Upper Sandusky branches have worked very hard to ensure their operations are following the 4Rs, and we congratulate them on earning their certification,” said Andrew Allman, executive director of the Nutrient Stewardship Council. “These facilities have proven their dedication to the long-term improvement of Lake Erie’s water quality by making nutrient recommendations based on the 4Rs,” said Carrie-Vollmer Sanders, Nutrient Stewardship Council chairwoman. MEDIA: High-resolution photos of Heritage Cooperative’s facilities receiving their 4R Nutrient Stewardship Certification signs are available below. Click the name of the photo with the associated cutline to download a high-resolution version. 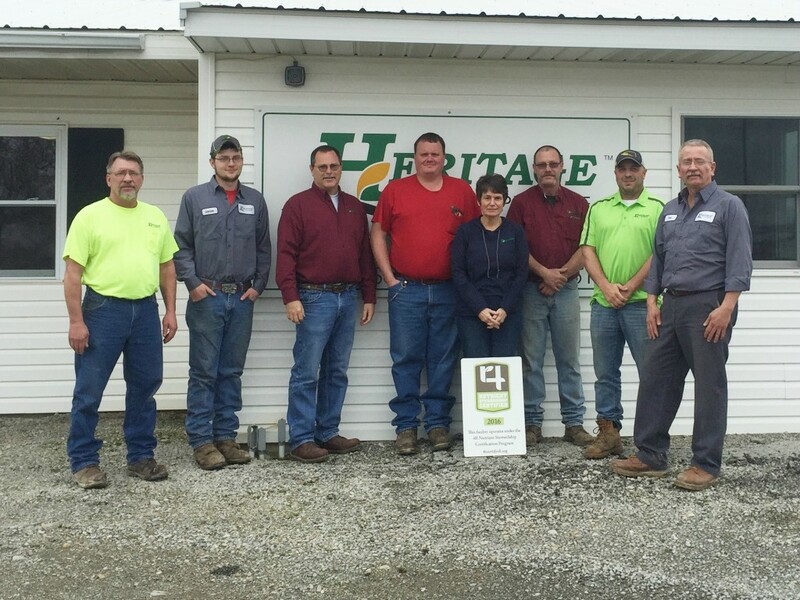 Heritage Sycamore: Heritage Cooperative in Sycamore, Ohio is now 4R Nutrient Stewardship Certified. Employees pictured (from L to R) include: Gary Weaver, Mike Margraf, Connie Gibson, Jeremy Swerlein, Jerry Weaver, Matt Marks and Dan Wienandy. 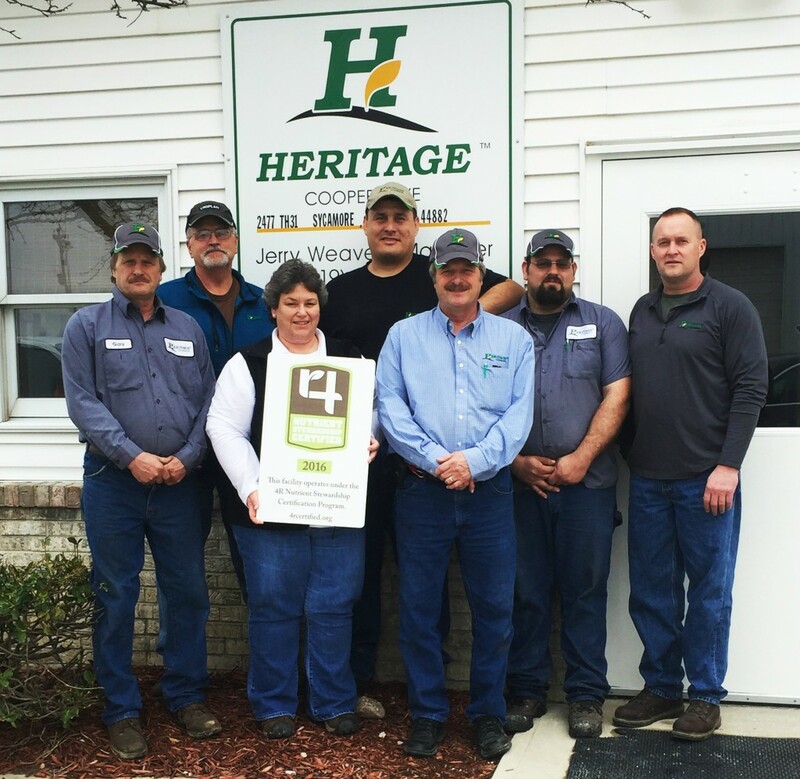 Heritage Upper Sandusky: Heritage Cooperative in Upper Sandusky, Ohio is now 4R Nutrient Stewardship Certified. Employees pictured (from L to R) include: Mark Rowe, Jacob Walter, Lee Orians, Mike Brodman, Bonnie Adelsperger, Jeff Willson, Jeff Kummerer and Del Armstrong.